Useful posts relating to wall, ceiling and/or floor panels in domestic applications - usually (but not necessarily) bathrooms and kitchens. We’ve all been there: the bathroom desperately needs a redo, but you just can’t face the prospect of signing it away for a week and letting the plumbers wreak havoc. So what happens? It gets put on hold. We’ll sort it next spring. It can wait until the new year. Yet many people are now reaping the benefits of quick, easy solutions, that can in many cases be done as DIY projects, and completed in just a couple of days. Tiling is a guaranteed remodelling technique. Those guarantees include: hours spent fixing tiles to the wall; grout becoming a future home for dirt and mould; one cracked piece ruining an otherwise pristine wall. Plenty of companies now offer large panels which essentially replace the job of tiles, for a fraction of the installation time. The installation method is pretty much the same, but instead of making up an entire wall with numerous small parts, the entire height of the wall is covered in one go. Here’s a tip: be sure to ask for a sample from your provider, and then give it a solid whack. Much as with the aforementioned cracked tile, there’s nothing worse than slipping in the shower and having your elbow go straight through a cheap, fragile panel. Make sure you know you’re buying quality; check for companies with a reputation for after sales care. As tempting as it might seem to tear out an entire suite and start from scratch, consider that it might be the smallest items that make the biggest difference. What will guests see more of when they step into your bathroom: the shower unit that’s past its best, or the curtain and/or screen that covers it? Instead of replacing your old windows, perhaps a different set of blinds, or new lights, might give you the effect you’re looking for? You might resent your nasty old toilet, but perhaps those marks are rust residue caused by the ageing screws of your toilet seat? Try small changes first before committing to any larger project ideas. A traditional hotspot for damp and mould to meet and greet, your ceiling can be reclaimed and made mould-proof, and in an easier fashion than you might think. The “usual” method - dry it out, scrub it away, and repaint - is basically resetting to zero and allowing the problem to begin all over again. Tongue-and-groove PVC ceiling planks are your solution here: PVC is essentially damp-proof, so while you’d still dry out and scrub away any existing problematic areas, you would then seal away the newly dry and mould-free ceiling with a mould-resistant covering. Sounds like a tough job? So long as the existing ceiling is substantial enough to be screwed into, then this is extremely straightforward. Fix one panel at a time, with the screws going into the groove sections. When you come to slot the next panel into place, the tongue will cover up the screws. Plus, if your ceiling is the victim of a trend or fad from yesteryear (artex, we’re looking at you) you can fix battens first and then simply screw into those. Job done! This entry was posted in Domestic Panels on June 25th, 2014 by IPSL. Mould and mildew are common in damp environments. Black spots on the shower curtains and mould around the edge of the bath are unsightly and bad for your health. Unfortunately moisture problems are common in bathrooms, washrooms and any other places where there are high humidity levels. So how can mould and mildew problems be prevented? Mould spores can cause all kinds of health problem in those who are allergic to them. Children and people with lung disease or compromised immune systems will also be sensitive to the presence of mould and mildew. People with asthma may find it hard to breathe in rooms where mould has been allowed to grow unchecked. In serious cases, mould can cause an asthma attack. In fact any which way you look at it, mould is not good for our health. Where does Mould and Mildew Grow? Mould and mildew love damp environments, so it is common to see mould spots and mildew stains in bathrooms and kitchens. However, mould will grow anywhere if the conditions are right, so carpets, furniture, walls and floors are all acceptable breeding grounds for mould spores. Tackling mould and mildew is a two step process: clean up the mould and mildew and then cure the underlying cause. Ventilation - Washrooms and other damp environments need adequate ventilation at all times. Extractor fans are ideal for shower areas and if you have air conditioning, use it. Clean out air vents regularly so that they can do their job. Heating – Cold environments encourage the formation of mould and mildew. Cold air doesn’t retain moisture well. Moisture condenses on cold surfaces, which encourages mould. Try turning up the heat during cold weather if mould is a problem in your home. Clean surfaces regularly – If mould and mildew are an issue, it is a good idea to clean problem areas as often as possible to prevent a build up. Consider replacing traditional ceramic tiles with mould resistant Proclad uPVC panels as this makes it easier to clean large areas. Improve air circulation – Open windows and leave doors open between rooms to encourage air to move around more. Humidity – Use a dehumidifier if humidity levels are higher than 60% (you can check this using a hygrometer). Leaks – Look for leaks around sinks, baths, and showers, and if there are any, repair them as soon as possible. Insulation – Ensure outside walls and other surfaces are well insulated to prevent condensation from building up. Drying clothes – Don’t dry wet clothes on radiators as this can make damp problems worse. Instead use a tumble drier that vents to the outside or hang wet clothes on a clothes line outdoors when weather permits. Mould and mildew can be highly destructive if left untreated. Over time damp and mildew will ruin soft furnishings and carpets. It looks unsightly and if you don’t deal with the problem it will get a whole lot worse. This entry was posted in Domestic Panels on June 3rd, 2014 by IPSL. Ceramic tiles are often thought to be the only way to waterproof a bathroom or shower area, but thanks to the wonders of modern technology, there are now other options to consider if you are looking for a change. Proclad panels are one such option. Made from PVC, Proclad panels can give a modern bathroom a beautiful clean look. They are a low cost alternative to traditional tiles, so if you are considering a bathroom refit, Proclad PVC panels are an excellent choice. But if you still need some persuading, there are five reasons why Proclad could be the best choice you ever made. Proclad panels are nice and easy to install. In fact they are so easy to fit that a competent DIYer will have no problem installing new Proclad panels in place of old ceramic tiles. The panels can easily be cut to size because they contain no plywood or MDF. Each panel is designed to fit together tightly with the aid of a colour co-ordinated trim. The panels are then fixed to the sub-wall using a special polyurethane adhesive. 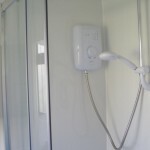 One of the top reasons why Proclad panels are so popular in bathrooms and shower rooms is that they are available in a fantastic range of different colours. White bathroom suites may be all the rage these days, but who wants a completely white bathroom that is devoid of colour? Although Proclad panels are available in white, you have the option of buying them in many more exciting colours, including Red Wine, Terracotta or Blush Pink! Nobody wants a leaky bath or shower. Water leaks cause a huge amount of damage and if left untreated, the end result is an expensive repair job. Fitting Proclad panels will ensure your bathroom or shower is completely waterproof, leaving you to have a nice, long soak in the bath in peace. As long as the correct trims are used during the installation process, even the joins between the panels are waterproof. Ceramic tiles may be a popular choice for bathrooms, but they are not the best surface to clean. Because bathrooms are such a high humidity environment, they are prone to mildew and mould growth. This is often a problem when you have ceramic tiles fitted because the grout between the tiles is a great breeding ground for mould and mildew. Grout and cracked tiles also attract dirt and soap scum. Proclad panels are completely smooth and are therefore very easy to clean; they are also mould and mildew resistant. Any product that comes with a ten year guarantee is clearly good quality. When you buy Proclad panels for your bathroom or shower, you can relax, safe in the knowledge that your new bathroom will look fantastic for at least ten years—well, it will if you remember to clean it regularly! Proclad panels are a great choice for a modern bathroom. Once you have tried Proclad, you will wonder what you ever saw in ceramic tiles. This entry was posted in Domestic Panels, Hygienic Cladding on May 20th, 2014 by IPSL. Everybody has tried a bit of DIY in the past and been put off by certain tasks which might seem too difficult to try without expert help. 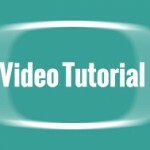 The good news is that with today’s technology you can find an astonishing amount of information online including many helpful tutorial videos. We’ve selected this video to show you how you can install Cladseal for PVC shower wall panels yourself without splashing out on expensive labour charges. DIY videos are now prolific on social media sites and across the internet making it really easy for any enthusiast to learn a great deal about installing products from the comfort of their own home. The craze shows no signs of slowing down either. In this tough economic climate it’s important for people to save cash whenever they can especially in the home. The housing market is on life support and any home maintenance savings you can make will benefit you in the long run. Even as long as 10 years ago you would have struggled to find information online as in depth as it is today. YouTube has only been around since 2005 but who could imagine life without it now? It’s not just video either. You can visit forums for tips and advice from experts for free and join groups where you can share knowledge with industry professionals. Be smart and you can really save. Cladseal installed in your shower or bath creates a watertight seal to prevent water leaking and causing damage to your room and property. Cladseal is hygienic, easy to clean, looks great, is easy to maintain and as you can see from the tutorial video, simple to install. Cladseal is installed between the wall panel and the ledge and can be installed quickly if you have the right tools and do the right amount of preparation, as the video demonstrates. 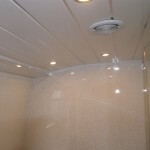 Cladseal makes for an attractive and clean looking modern bathroom or commercial washroom. It is perfect for installing in combination with wall cladding around showers and baths and will immeasurably improve the look of your bathroom. You can buy Cladseal PVC Wall Panels from IPSL here and use the video above to install it in your bathroom yourself. Take the plunge! The more you learn the more you save! This entry was posted in Domestic Panels, Shower Wall Cladding, Wall & Ceiling Cladding on December 13th, 2013 by IPSL. Top tips on how to maintain a spotless washroom with plastic wall cladding. How hygienic is your bathroom or washroom? Keeping your bathroom clean and tidy is vital for your personal health and wellbeing and that of your employees. Germs can hide in all sorts of places and they especially prefer and environment which is warm and moist to breed. With that in mind it is easy to see why the common bathroom is a haven for all types of nasty bacteria which can cause numerous forms of illness if you don’t keep the area clean. Studies have shown that a dirty bathroom sink can host more bacteria than the toilet and that many types of bacteria can grow on any bathroom surface, including your walls and ceilings including the common Streptococci bacteria which causes sore throats, infections and fevers. The implications for businesses are even more severe. You could be leaving yourself open to litigation if you are seen to be irresponsible with hygiene requirements so don’t take the risk. It’s not all about health however. A dirty looking bathroom is sure to put off anyone who visits your home and can even lower the value of it. The fact remains that we spend an awful lot of time in our bathrooms and as a result we should look after them. Mouldy bathroom tiles and walls are an eye-sore yet a surprisingly familiar sight for a lot of homeowners. Mould is caused by excess condensation in your bathroom and can turn from a small spot to large growth in next to no time. If your bathroom tiles have been taken over by a colony of mouldy bacteria it might be time for a change. 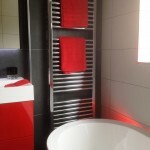 Plastic wall cladding in your bathroom could solve many of your problems. When a mould infection takes hold you will need to clean an area three times as large in order to fully decontaminate the surface. Bathroom tiles are notoriously difficult to clean and mould will easily infect the grouting between the tiles. Retiling is an expensive option and not a long term solution. Plastic wall cladding is smooth and easy to clean which means you can effectively remove bacteria and keep the area contaminant free. Bathroom mould lives off organic materials and importantly, water. If you remove one of these the mould cannot survive. Water easily passes over plastic wall cladding leading to drier surfaces and less chance of infection. 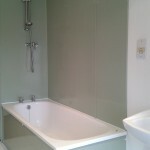 Plastic wall cladding is excellent for bathrooms, shower enclosures and washrooms and can be a perfect solution. Our Proclad plastic wall cladding is suitable for commercial kitchens, canteen walls, hospitals, fast food outlets and changing areas and meets all EU Food Hygiene regulations. Plastic wall cladding is cost-effective too. Get in touch with our team to discuss your specific requirements. This entry was posted in Domestic Panels on December 4th, 2013 by IPSL. Most of the homes that Berneslai look after have previously used tiles for the wall finishes in the bathrooms and showers – initially tiles promised a hard-wearing and waterproof finish, but as times goes by the grouting deteriorates, mould grows, tiles get cracked and broken, and in some cases tiles start to fall away. They needed a product that would not have these problems, would have a long life expectancy, and importantly, would be a straight forward installation – controlling labour costs. IPSL’s Proclad Plus Grade product has proved to be the perfect solution. The grade chosen is a rigid PVC sheet that covers almost 3 square metres each, trims for joints and edges, and a curved profile for finishing internal corners. 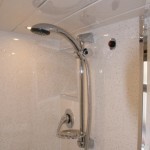 No specialist wet trade is needed for the installation, which is fast and hassle-free. Maintenance is virtually non-existent as there is no grout for mould to grow on or to come loose; the impact resistant plastic does not crack like tiles, and the large jointless surface is easy to keep clean. For Barnsley, Proclad has become the product of choice for cost effective, waterproof, easy-clean and durable walls. This entry was posted in Domestic Panels, Hygienic Cladding, Wall & Ceiling Cladding on November 1st, 2009 by IPSL. Bathroom Wall Panels - It's The Future! Bathroom wall panels are a brilliant new concept in bathroom design and decoration! Bathroom wall panels are a new innovative way to decorate your bathroom; panels are made from a uPVC material and the panels have been designed in a plank form to ease the task of installation. Bathroom wall panels are interlocked together by means of a tongued and grooved system and when adhered to the wall create a totally waterproof covering for your bathroom. You don’t have to be a tradesman to install these bathroom wall panels, almost anyone with just the minimal amount of DIY knowledge can fit them. Suitable for either applying to plastered walls or over existing ceramic tiles these panels can be fitted to almost any substrate. Gone is that horrible time consuming task of grouting and in the following years no mildew or fungal growth between the tiles to replace or repair -great news! There are many styles and colours to choose from, they range from black marble or just plain white plus almost every other colour and shade in-between. When the project is finished you will have a bathroom walls to be proud of that will last for many years to come. This entry was posted in Domestic Panels on October 5th, 2009 by IPSL. 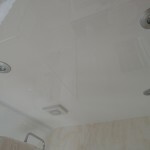 Bathroom ceilings are often a problem area in the home. The steam and resulting condensation plays havoc with the usual ceiling covering such as painted plaster or wall paper over plaster. The continual presence of moisture leads to mould, and eventually paint and paper peel, and even plaster starts to come away. The next time you are in your shower have a look over your head – you may find the bathroom ceiling in quite an unsightly condition. Now maybe you are one those people who don’t care about this type of problem, but if you do care then I have the solution for you. UPVC panels are perfect for covering bathroom ceilings; they are made from the same stuff that is used in making modern windows and doors so are totally waterproof, and do not rot or deteriorate in any way when exposed to water or steam. These panels are tongue and groove so fitting them together is a breeze. Unless the existing bathroom ceiling is in really bad condition then the uPVC panels can be screwed directly on with minimum preparation and a range of trims are available to finish the job off nicely. A range of styles and colours are available, but the two most popular are plain white, and white with a silver highlight line running along the panel. The finished job will look good for years and years, and you won’t need to do the job again – unless, of course, you have several bathroom ceilings in your home! This entry was posted in Domestic Panels on September 28th, 2009 by IPSL.